Note: This is huge topic we are barley scratching the surface of in this article. 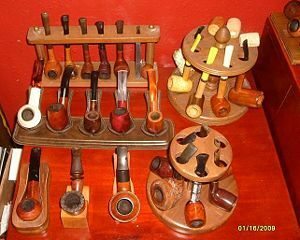 Ben Rapaport does an excellent job of outlining more aspects from a collector's standpoint in his article Collectible Pipe-related Ephemera: Here Today, Not Necessarily Gone Tomorrow! (PDF). A nice to have but not really a need to have, great for indoor smoking so you don't bosh your spent tobacco onto your brand new sofa but not entirely required as anything will do the trick. For many pipe smokers, a quality pipe specific lighter is an integral part of their pipe smoking experience. Others prefer wooden matches, citing that even the best lighters will taint the experience with fumes from the spent fuel. In matches, a wooden kitchen match works best, and to be sure a wooden match is not only affordable it is relatively safe for your pipe. Even matches can impart fumes, but those can me minimized or eliminated if one is careful to let the sulfur burn off completely before apply flame to tobacco. All experienced pipemen agree that using a torch lighter, such as intended for cigars, can quickly ruin a pipe. They are to be completely avoided by anyone who cares about their pipes. Choosing a good lighter, one designed for pipes and that matches your budget and sense of aesthetic, and then learning to use it carefully is a viable option for those that find matches are not for them. Zippo makes an affordable pipe specific lighter in several styles. 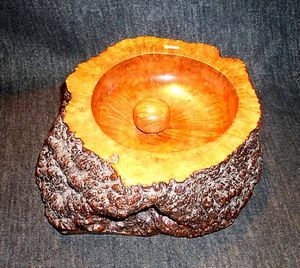 It has a special windscreen (pipe insert) with a hole that allows the flame to be drawn into the pipe bowl. Many pipemen swear by them and have learned to use them to minimize the impact of the fumes from the spent fuel. Others find that the naphtha lighter fuel imparts fumes regardless of how they're used. Proponents minimize the fumes by allowing them to burn off after first lighting the lighter and before drawing the flame into the tobacco, much like letting the sulpher burn off a match. The three other major US non-butane lighter were the Nimrod Pipe Lighter, the Nimrod Commander, and the Beattie Jet Lighter. Two Nimrod models were eventually manufactured. 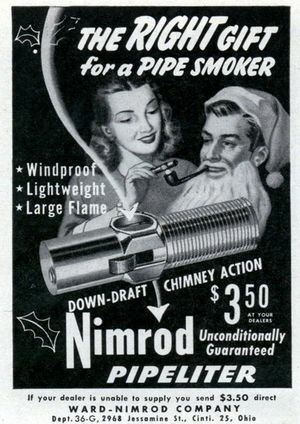 The Pipe Lighter model was unique in that it looked like a nut and bolt, and was lit by holding a thumb on the spark wheel, and pulling apart the lighter. A second model was the Commander (or Admiral), which resembled the current Zippo pipe lighter. There are several Old Boy copies to choose from as well, of varying levels of price, and success. 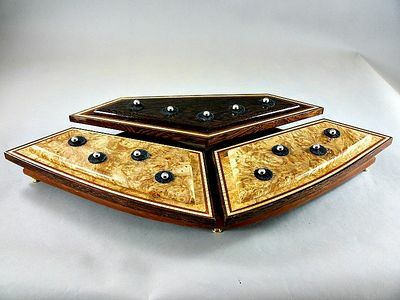 Among these are the Jifeng copy of the Corona Old Boy Pewter Finish with Pipe Shapes, the Yibao with Chrome Lines, and the Yibao Leather Wrapped. The Savinelli IM Corona Old Boys are made in Japan, while these copies are manufactured in China by the same company; Wenzou Yibao , who also manufacture other well known named brand lighters, such as Colibri. One Old Boy copy is actually not a copy at all, but more Old Boy inspired. It is made by Kiribi in Japan, and distributed by Laudisi. Dunhill makes excellent pipe lighters. Colibri makes excellent pipe lighters, including the now discontinued "Clip" lighters made to clip in the shirt pocket like a pen. IM Corona Old Boy in Smooth Briar. Xikar offers three mid-range butane pipe lighters including the Resource  , the Pipeline  (an an Old-Boy knock off), and the Scribe  , a Colibri "Clip" knock off. An inexpensive but still refillable butane lighter is the IMCO. 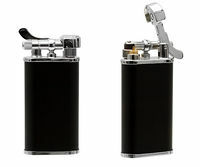 Not an elegant lighter, by any means, but a step up from a bic or generic cigarette type lighter and more importantly, one that is designed for use with pipes with an inclined flame. 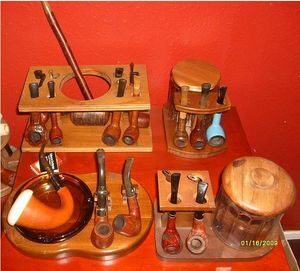 Pipe racks and stands come in many configurations, ranging from simple briar singles to more intricate ashtray models. Here are some examples. Pipe tampers are essential. Used for tamping tobacco. 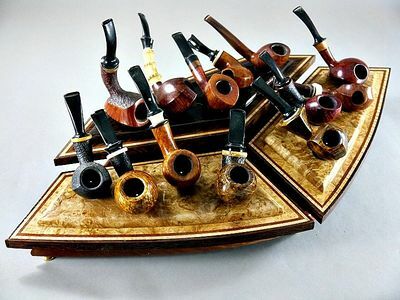 Like anything pipe related they range from cheap and functional to works of art. 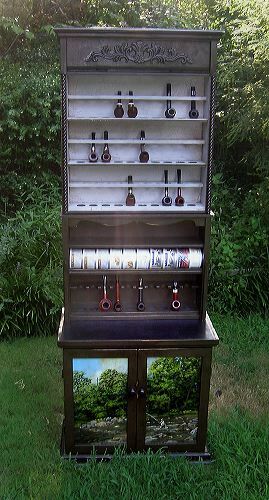 Electric Briar Pipe Dryer by Blue Mountain Pottery, USA. German beer mug "Pfeifenclub Michelau" (Upper Franconia). In former centuries smoking in private houses was widely forbidden by fire police regulations. 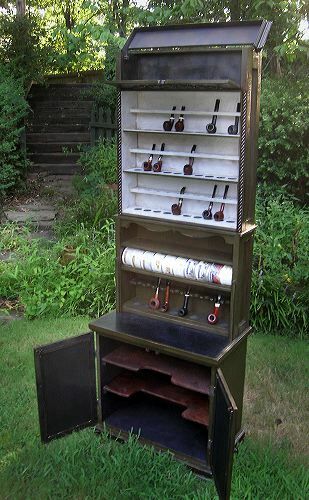 This was the origin of many a pipe or smoker's club. More recently many good housewife forbade her husband to smoke at home for the sake of the curtains. Humorously indicated on the mug by a bird escaping from it's cage. Avon after-shave lotion, Germany ca. 1980. 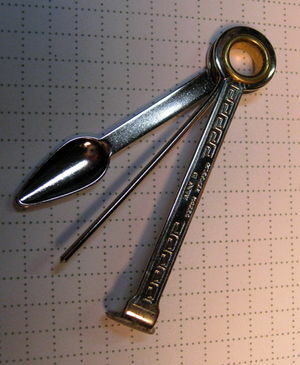 Pin "Danish fancy"; origin unknown. This page was last edited on 26 March 2019, at 18:59.